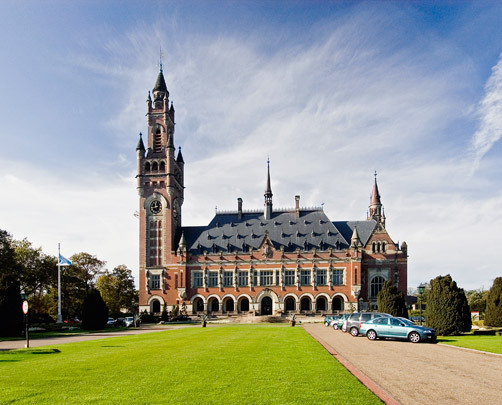 One of the resolutions adopted at the First International Peace Conference at The Hague in 1899 was to create a Permanent Court of Arbitration to mediate in international conflicts and alleviate threats of war. The construction of the Peace Palace was made possible by a gift from Andrew Carnegie. The French architect L.M. Cordonnier won an international competition with over 600 entries. Yet the architecture of this explicitly international building adheres to the Dutch renaissance revival style. Its interior is a rich mix of Dutch and Italian styles. The original competition design ranged four wings round a courtyard with tall roofs and monumental towers at the four corners. Cutbacks in expenditure meant that only the tall tower left of the entrance was built.